Ohhh Audrey Hepburn. What a babe ey? I don't think you can think of the phrase 'style icon' and not have Audrey spring to mind. Known for her impeccable outfits, perfect updo's and those signature eyebrows - her style still continues to inspire the fashion world, even today. She wasn't just a pretty face with a killer wardrobe though, or even just a brilliant access. There was a lot more to this woman than most people know about, which made her a person to look up to, a real icon. So for today's post not only am I paying homage to her sleek style with an outfit inspired by her, I'm also going to speak about some of the truly amazing things she's done for humanity, including devoting the final years of her life helping disadvantages kids around the world. Hope you enjoy! Dressing like Mrs Hepburn: What Would Audrey Wear? To master the Audrey Hepburn look you need a few key pieces in your wardrobe. Audrey's signature looks included: the big midi skirts, turtle neck tops, halter neck dresses, oversized button down shirts and (of course!) the little black dress which she's most famous for. A good thing to have in mind when putting together an Audrey inspired outfit is 'elegance' - think lady of the manor glamour! Her style was based on simple staple pieces but always oozed class. 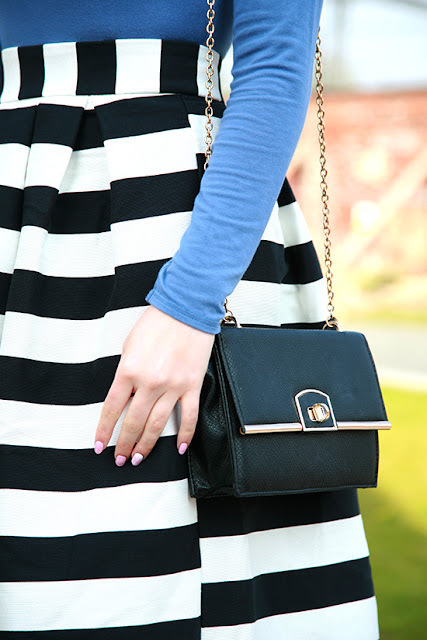 For my Audrey inspired look I went for a striped Asos midi skirt, a blue turtle neck top, strappy black heels and the up do just to finish the look off. You know those outfits that make you feel like a proper lady? This was one. I wish I could go get a pint of milk at the shop dressed like this, imagine how epic you'd feel! But it's probably best saving an outfit like this for a slightly more, formal occasion. I think I managed to create a pretty elegant look, however I've not quite mastered the delicate Audrey Walk - just ask my photographer Matt who had to pull my foot out of a path during the shoot when my heel got stuck. Staying class, always! Thinking like Audrey: What would Audrey do? Despite being regarded as a style icon, Audrey was known to be a humble woman who's philosophy was to put others before herself. She showed true compassion for people and in 1989 became a UNICEF Good Will Ambassador. It's no surprise that Audrey had such a strong need to get involved with UNICEF, since she herself received food and medical help from the charity as a teenager following World War 2 - when the nazis cut off food supply to Holland where she lived, and she almost starved to death! - travelling to more than 20 countries to meet and help children who were struggling to live. - giving up to 15 interviews a day to raise awareness for the UNICEF emergency operations. - working on projects to provide drinking water in Guatemala, schools in Bangladesh, improve the lives of impoverished children in Thailand & training programmes for women in Venezuela. - working tirelessly for various causes even in the final months of her life. So to be like Audrey it's not just about dressing well and feeling confident, you need to have some goodness within and have real compassion for others, as there is never a more attractive quality than that. you look gorgeous babe! and definitely thank you for sharing a little bit about Audrey Hepburn :) Love your outfit! You look absolutely stunning in this outfit, I love this! You look gorgeous, she was my style icon as well though I'll never be able to get even close to her fashion sense. You did a lovely job here!